Atlanta is a popular and coveted destination for groups seeking educational and leisure activities in the South. Atlanta’s urban hub has something for everyone, at every price point, from world-class museums to great theater companies and superb sports teams. If your group is looking for activities to complete its travel itinerary but you are facing budgetary constraints, then we can help by pointing you to free activities in Atlanta that everyone in your group can enjoy. 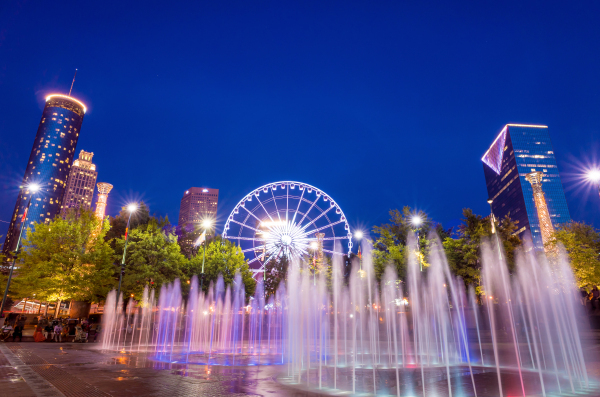 If you have a group with children, then consider ending the day at the Centennial Olympic Park Fountain of Rings. It is a truly enjoyable summer activity that will help cool your group off and burn energy, leading to a restful night for the youth in your travel group. Just a mile from downtown Atlanta, this is a fantastic little excursion for adults with a passion for history, botany, and architecture. Historic Oakland Cemetery is the final resting place for well-known citizens such as Margaret Mitchell and Maynard Jackson. The cemetery has outstanding examples of early 18th century architecture and sculpture, and a magnificent display of ancient oak and magnolia trees. Thirty-five acres dedicated to the preservation of history, highlighting the life and works of Dr. King. Enjoy beautiful landscapes, monuments, and a visitor center with artifacts and exhibitions that narrate important events of the civil rights movement. Atlanta’s southern hospitality will make your group feel at home. With advanced planning, your group will be able to enjoy group discounts at sporting events, museums, and other activities. With all your day activities planned, let your Groople travel agent help you reserve discounted hotel rooms in Atlanta’s best hotels. Taking the whole family to enjoy NASCAR activities in Georgia? Check out this Groople Atlanta guide.